– Presto-Xover: Select your oscillators and customize entry/exit, Bracket Orders, Slicing, Trailing SL etc. Institutional Brokers : Institutional Traders in India are technology driven and would like to learn and adopt new technology if it increases their clients’ bottom-line. They are most apprehensive of missing out on market opportunities or worse, select the wrong opportunities. 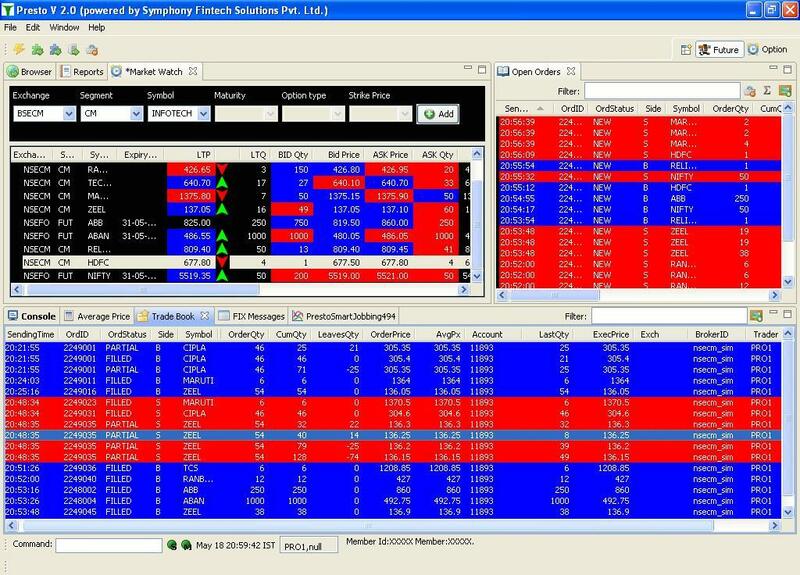 Symphony FinTech being a pioneer in the Algo Trading Automation, have worked with various Institutional Brokers and provided them a completely customized solution. Capitalize on the previously missed opportunities which translate to better alpha. Trade on increased number of Scripts/Symbols. Each dealer of the client is now able to handle greater volume. Client has increased bandwidth to handle more customers. Tap FII investors looking out for automated Platforms / Trading strategies. With back-testing/Paper trading capabilities, utilize full potential of your research team.